Flexi-access drawdown (FAD) changes your pension into a type of pensions savings account available for anyone aged 55 and over. It allows you to take your 25% tax free lump sum and the remainder of the fund sits in a tax efficient pension plan that can grow tax free, even if you are a higher rate tax payer. As an alternative if you do not want the full tax free lump sum from your pension it is also possible to draw an income from the pension of which 25% is tax free and the remainder of the income is taxed at your marginal rate. This is called uncrystallised fund pension lump sum (UFPLS) and providers are combining this with flexi-access drawdown. For people that continue to work, they will be able to make contributions to the pension and receive tax relief with the option of immediately taking their 25% tax free lump sum. The annual allowance is £10,000 and if you have no taxable income you can contribute £3,600 each year. The combination of tax efficiency, low volatility by using a smoothed growth fund, easy access with penalty free income make flexi-access drawdown an attractive alternative to traditional bank or building society savings which often have low upper limits, restrictions on taking income and the loss of interest for early encashment. There is also the opportunity to leave the fund to a dependant, nominee or successor on death and in some circumstances completely free from tax. Take full fund - The fund can be taken over two or more years to minimise your tax liability. Maximum income - Take enough each year to last your lifetime or until age 105. Similar to an annuity - Match the income from a lifetime annuity. £Nil regular income - Allow the fund to grow taking cash lump sums when you need it. By remaining in a pension environment rather than savings, the fund benefits from tax free growth with the option of smoothed return funds offering very low volatility and returns of 5% to 6% per year on pension funds of £30,000 and more. Ideal for smaller funds from £30,000 and more. Take your tax free lump sum now. Easy access to your full fund as income or single lump sums at any time. Take your whole fund as a cash sum less tax at your marginal rate. Leave the fund in a secure cash fund or select a smoothed growth fund with a 5% to 6% return. Low cost structures with no extra charges for withdrawals. Contribute to the plan and receive tax relief at your marginal rate or £3,600 pa if you have no taxable earnings. The fund, in the event of early death, can be transferred to your dependant, nominee or successor. You can consider your options at any time, including a lifetime annuity, fixed term plan or any other option available. You can move your fund to any other flexi-access drawdown at any time without penalty if you are offered better terms. Take advantage of future product innovation offering you attractive options such as combining a guaranteed income and access to capital. Avoid buying a lifetime annuity now when rates are near an all time low. You do not have to give your capital away to an insurance company in exchange for an income. For flexi-access drawdown there is no limit to the level of income that can be taken from the plan. The annual allowance is limited to £10,000 pa should you wish to contribute to your pension fund during the year. For those that remain in capped drawdown, this is subject to an income limit of 150% GAD. You can also contribute to a pension in the same tax year. The lifetime allowance is £40,000 pa which is especially useful if you are still working and can benefit from tax relief. If you wish to draw the fund tax efficiently, this can be achieved over a number of years tax efficiently to avoid paying higher rate tax. You can select an income of your choice to ensure you only pay basic rate tax or even no tax if this is within your personal allowance. Income from flexi-access drawdown can be taken monthly, quarterly, half yearly, annually or as single withdrawal when required. The pension rules were changed from 6 April 2015 to allow greater flexibility to leave a flexi-access drawdown to dependant, nominee or successor on the death of the member. This means the pension can also be left to a beneficiary that is not a dependant. The tax position depends whether death occurs before or after the age of 75 and if your pension fund is uncrystallised (not taken) or crystallised where you have taken a tax free lump sum and flexi-access drawdown. The following is a summary of the tax payable for the different scenarios. * Changes to marginal rate from 2016/17 tax year. The advantage of flexi-access drawdown is the fund can be left to a dependant and thereafter to a successor such as children and in some circumstances tax free. Funds in flexi-access drawdown can be invested in different ways such as cash, protected growth or fully invested. Which is the best option depends on the amount of time you intend to be invested in drawdown and your attitude to risk. Cash is low risk and currently produces low interest of about 0.5% per year, protected growth is defensive offering 4.0% per year which is added daily. For the highest return a fully invested fund has higher potential returns of 4-5% per year but can be volatile falling and rising daily. Investment volatility in retirement coupled with taking an income can suffer from negative pound cost averaging. This occurs if you need to cash-in more units over time than you should to provide the same level income. Low volatility in funds reduces this risk and this can be achieved with smoothed growth funds. A smoothed growth fund takes the expected annual growth and divides this by 365 days, adding this to your fund on a daily basis. The following table shows the volatility and expected return for cash, a smoothed growth fund and invested equity portfolio. * Volatility is a measure of how value goes up and down compared to the FTSE-100 index with a volatility figure of 100. A smoothed growth fund offers low volatility and this is achieved as the funds expected growth rate is added daily to your fund. Adding the gain daily produces the smoothed return and more certainty that income can be taken without volatility compared to an invested equity portfolio. This is particularly the case where the time frame for the drawdown is short, say two or three years. Flexi-access drawdown can offer a low cost, low risk sterling based cash fund for those that wish to draw their whole fund over the next two or more years to minimise their tax liability. Depending on your attitude to risk and the level of risk you are happy to take will determine the size of fund you can have in the future. If you have a longer time period for your pension fund such as three years or more you can consider a smoothed growth fund. However, where you want growth in the fund there is always the risk that the fund can go down as well as up, even when smoothed, although with much less volatility than actual equity markets. As an example, a 60 year with a fund of £133,333.34 could take a tax free lump sum now leaving £100,000 for drawdown. Any income can be taken from the fund, however, if you make this similar to a 100% joint life payable monthly in advance the income would be £3,640 pa. The following shows a smoothed growth fund with income after charges is 4.0% per year which is added the the fund on a daily basis providing a very low level of volatility for a growth fund. 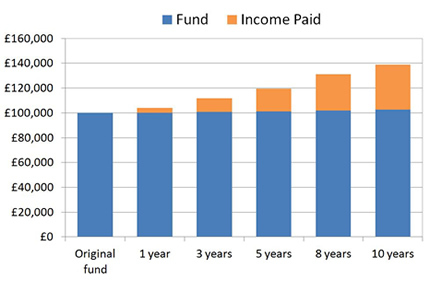 Source: Sharingpensions.co.uk research for a 60 year old with a fund of £100,000. Combination of fund and income paid of £3,640 pa.
To take the whole fund as cash in a single tax year would mean paying higher rate tax. In most cases people may be willing to pay basic rate tax so the fund needs to be taken over two or more tax years. For those people that would classify themselves as low-medium risk investors a smoothed growth fund can be considered. Once the tax free lump sum is taken, all cash sums removed from a pension plan are subjected to personal taxation. If you only take out an amount below your personal allowance you will not pay any tax on the income. The first £10,000 of income is the personal allowance and this is not taxed, the next £31,865 is at basic rate tax of 20% and thereafter higher rate tax at 40% applies. HMRC apply emergency tax code 1000LM1 which means any lump sum is taxed not at your marginal rate but a higher tax rate. If you take more than £13,300 as a lump sum the tax rate will include the 45% additional tax rate. To avoid paying higher rate tax the fund would need to be extracted over a number of tax years. Suitable if your fund is £30,000 or more before tax free cash. You can select a safe deposit fund or higher risk smoothed growth fund depending on your attitude to risk and time frame. The flexi-access drawdown quote offers easy access with flexible income and you can review your options at any time.